The City of Johnstown Recreation is dedicated to providing superior quality recreation programs and services to all residents of the area regardless of age, economic or social status. Through our programs, we seek to strengthen families, promote wellness, build self-esteem and enhance the quality of life for all of the participants in our community. We will strive to maintain and improve all of our facilities to keep them safe and enjoyable for all, as well as preserve and promote the appreciation of our history. Stackhouse Park is a wooded park with over 277 acres and 7 miles of biking and hiking trails and the summer home of Shakespeare in the Park. Stackhouse Park is located between the City of Johnstown and Westmont Boro. The City offers 14 playgrounds in various neighborhoods throughout the City. The City’s Public Works Department is responsible for the maintenance of these areas. If you would like to report a safety or maintenance issue please call (814) 533-2061. Location: Iolite Ave & Graywood St.
Sandyvale is a pioneer cemetery that was developed by the Horner family and used by many first families when the City of Johnstown, Pennsylvania was established in 1800. The veteran’s graves date from the Revolutionary War through World War II. Sandyvale has been a part of the fabric of the City and region for over two centuries. In the early years it provided a gathering place for many community civic and social events. It was a beautiful green spot in the pioneer days but with the industrial era and the development of the steel mills and plants and the birth of the railroad access to this industry, it came to be an area that was isolated and forgotten, sustaining extensive flood damage and neglect for many years. Currently the site is 10.6 acres of flat grassy lawn and is the last large open green space in inner city Johnstown. A Master Plan program has been coordinated by the renowned design and landscape architectural firm of Marshall – Tyler – Rausch, LLC to preserve this historic location creating a beautiful, thriving, self-sustaining memorial botanical garden. To develop the site of The Sandyvale Cemetery as a memorial garden and dog park, embracing local sentiment, appropriate design, sound planting and landscaping theory and practice — thematically designed and planned. Construction of a greenhouse/conservatory and classroom area to conduct hands-on training for students, facilities for technicians, and workshops/seminars on horticulture for volunteers and the general public including the physically challenged. To coordinate the implementation of the gardens project with existing and/or proposed open space, trail, historical and recreational facilities within the area, recognizing and building upon the linkages and interrelationships with these other projects. The appropriate incorporation of statuary, fountains, water features, benches, gazebos, garden ornaments, and walking bridges. To accommodate the horticultural interests of professional and private citizens, i.e. master gardeners, instructors, youth/student and volunteer groups as well as the general public. To attract private, public and foundation assistance in the development and maintenance of the memorial garden facility. The development of a visitor’s center and memorial wall honoring former citizens and veterans including family information, historical photographs of the era and memorabilia of Sandyvale, the City and region as relates to its history. The tasteful, artful and sensitive use of remaining grave stones within the gardens in concert with the concept of Garden Cemeteries. The delineation of activities and services, which would serve the region, again sensitive to the original use of the site. 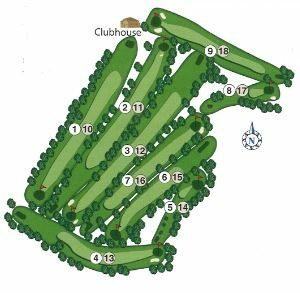 A 9-hole par 35 course located in Johnstown, at 361 Goucher Street. 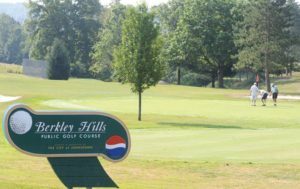 Owned by the City of Johnstown and operated by The Royal Berkshire Inc., Phone 814-288-2513 for Tee times and green fees.